Most will have heard the saying “oils ain’t oils!”. This is more true today than ever before. What they are trying to say is that all oils are not the same. Whilst this is an advertising gimmick to infer that one brand of oil is better than others, basically there is not a lot of difference between oils that have to meet an American or Australian Petroleum Institute Specification. Where the important difference lies is in the specification or rating for the oil. The API have set out specifications for oils for Petrol and Diesel engines to meet Manufactures’ Warranty requirements to keep pace with the changing demands in fuel and oil Technology. These API specifications are detailed in the Performance Products Data Sheets. The API Service Classifications commenced from the 1940’s and are currently rated from, SA to SG for Petrol engines (SG being the highest specification) and from CA to CE for Diesel Engines (CE being the highest specification) Whilst many engines will operate satisfactorily on the earlier classification oils, it is important to use to Manufacturer’s recommendation as a minimum specification, and the latest API Specification for any engine fitted with emission control equipment. Lean burn combustion systems, which are designed to meet current reduced exhaust emission levels are considered to be a contributing cause to a recent epidemic of potentially damaging black sludge in engines. This has become one of the most significant problems to confront engine designers and Oil Companies during the past 20 years. A recent article in Car Magazine says that it is formed by nitrogen fixation of the carbon constituents in the lubricant. The black sludge is a heavy tar-like deposit which forms in cooler parts of the engine where lubricant and oil mist become trapped. It is not mobile and can build up rapidly into heavy deposits which eventually clog oil strainers and filters, cutting off lubrication to vital engine parts. The deposits become to thick that a screwdriver can be stood up vertically in the sludge. According to the report even some SF oils come out quite badly in respect of black sludge deposits. Investigation has shown that it is affected by fuel quality, the reduced tendency for modern engines not to use oil, with consequent additive depletion, extended oil change periods, short journeys, and low specification oil. The problem has only occurred with the reduction of lead additives to fuel, and using lean burn mixtures to comply with lower HC and CO emission controls. The American Petroleum Institute introduced the SG/CD Classification in response to these problems. What can be done to minimize the effect of the above conditions? Ensure to use the highest specification oil: SG for Petrol engines, and CD or CE oil for Diesel engines. Do not extend oil change intervals, particularly in short run and /or cold climate or humid operating condition. Do not store oil for long periods. Oil additives can settle, stratify or migrate to the sides and bottom of containers Preferably buy oil only when you need it, and keep reserves to a minimum. When adding the Pro-Ma MBL Oil Concentrate to engines more than two years old, or with more than 50,000 kilometres/30,000 miles on the odometer, it is prudent to recommend an oil and filter change after 1,000 kilometres of operation in case there has been an accumulation of black sludge. SG/CD and CE Oils and the Pro-Ma MBL Oil additive can progressively remove this contaminant from its location. Oil pressure gauges and warning lights should be frequently monitored during this brief period and immediate action be taken should any abnormality become apparent. With most engines it is possible to inspect the inside of the value chamber by removing the oil filler cap, and checking with the aid of a torch. If inspection shows the engine to be badly sludged, then the appropriate action can be taken. The Pro-Ma MBL Oil additive cannot rectify broken components, or repair parts that have reached the end of their working life. However if it is used correctly it can reduce engine wear and extend the useful life of moderately worn components and maintain internal engine cleanliness. 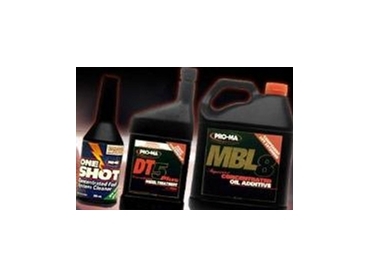 The Pro-Ma MBL Oil additive is available from Pro-ma Fuel and Oil Additives .